Inspired by the idea that music can prevent genocide, unite people, and bring joy, two young cellists—brother and sister—share their "Duo Brikcius—2 Cellos Tour" in a series of concerts in the Czech Republic. After performing at the 54th Dvorak festival in Frydlant earlier this month, Anna Brikciusová and František Brikcius will be featured at a concert in the Jewish Museum in Prague on June 18. The highlights of the program will be Fantasie IV (2008) by Czech composer and organist Irena Kosíková and Duo for Violin and Cello (1939–40) by the Jewish-Terezin composer Gideon Klein, arranged for two cellos. 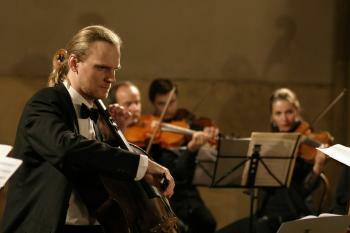 Organized under the auspices of the Prague City Council for Culture and Heritage and the Italian Culture Institute in Prague, the concert will also feature music by Luigi Boccherini, W. A. Mozart, Gioachino Rossini, and Paul Hindemith. In a special interview for The Epoch Times, František Brikcius from Duo Brikcius shared that the selection of the music for this concert was no accident. The definition of "Terezin" composers originated from the name of the town of Terezin, situated north of Prague. During World War II, the Nazis deported many artists to Terezin, which was used as a stop on the way to concentration camps. Irena Kosíková's father, philosopher Karel Kosik, survived after being imprisoned in Terezin. Two Czech composers, Pavel Haas and Gideon Klein—who didn’t survive—were also held at the so-called Terezin Ghetto. The young cellist adds that "Duo Brikcius—2 Cellos Tour" is a follow-up of two other initiatives that are the predecessors of the tour. One of them is the concert program “7 Candles” (2006-2007), performed by František Brikcius and the Talich Chamber Orchestra under the stick of Jan Talich in Prague and in Terezin. 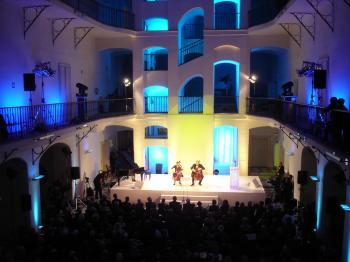 It was part of the Year of Jewish Culture in the Czech Republic. The second was the "Weinberger Tour," a cello and piano concert tour to commemorate the 40th anniversary of the death of the great Jewish composer of Czech origin Jaromir Weinberger. The repertoire included the wonderful sonata written by Holocaust victim Erwin Schulhoff and a newly discovered Lamento by the "Lost Composer" James Simon (murdered in Terezin), which was introduced to Czech audiences for the first time. Despite the dark stories behind the music, Brikcius is confident that through the marvel of music, resentment can be resolved and people can be brought together. “Music should be … a bridge between different cultures and religions,” he says. Siblings Anna and František Brikcius have both loved the cello for many years. Both, too, have a great deal of solo experience behind them. But in order to create a synergy and explore music written especially for two cellos, they decided to embark on the road of this extraordinary discovery, which, they believe, has huge hidden potential. 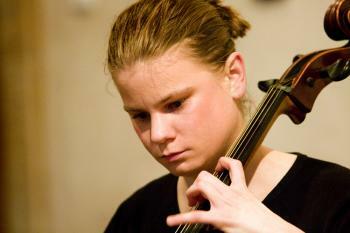 “My sister Anna Brikciusová is a cellist as well. There is a great deal about the sound and color of two cellos, the enormous cello range, wonderful repertoire—and two cellos are fun to play and travel with. Actually, as you can see from our repertoire, the two cellos combination has been known for centuries, since the very beginning of cello existence." The project strives not only to perform works for cello and help maintain the tradition of known composers, but also to introduce music to the public that is rarely heard. Besides the duo project with his sister, František Brikcius looks forward to several brand new projects. The cellist is currently preparing a premiere of the ballet “Makanna” based on the novel of Jewish writer Jirí Weil to mark the 50th anniversary of the writer's death. The piece was written by Czech composer Irena Kosíková for orchestra, with a special appearance by a cellist and a singer. Another initiative is the unique program "eSACHERe" for solo cello, scheduled to be performed in the autumn of 2010. A dozen composers from around the world have written 12 different compositions on notes based on the name of Swiss conductor Paul Sacher (Es, A, C, H, E, Re). The notes used are E flat ("Es" in German), A, C, B natural ("H" in German), E, D ("Re" in French). The project was commissioned by the world-famous Russian cellist Mstislav Rostropovic. Mr. Brikcius will perform the whole set, the first time it will be performed in its entirety. In general, František Brikcius focuses on the interpretation of cello compositions written by composers from the 17th to the 21st century, with special consideration given to the compositions for solo cello. “I'm concentrating on works by Czech authors like Antonin Dvorak, Bohuslav Martinu, Leoš Janácek, Jaromir Weinberger, the Terezins—Gideon Klein, Erwin Schulhoff, James Simon—as well as contemporary composers Conrad Beck, Luciano Berio, Pierre Boulez, Benjamin Britten, Luboš Fišer, Alberto Ginastera, Irena Kosíková, Jirí Matys, Witold Lutoslawski, and others.